Transform your morning with savory oats. Alon Potilskis was never a big breakfast eater — until he went to Japan. There, he discovered an unexpected morning meal he liked so much that he’s been enjoying it ever since: oatmeal made with veggie stock, eggs, miso paste, green onion, bonito flakes and togarashi, a hot-pepper blend with citrus peel and garlic. If you’re more likely to reach for fruits and brown sugar than eggs and onion to top your oatmeal, you’re missing out on a whole other world of tasty and nutritious oats recipes like Potilskis’ Japanese-inspired dish. Oats are popular because they’re a “blank canvas” for a nutritious and satisfying morning meal, says registered dietitian Bonnie Taub-Dix. They’re also the whole-grain source with the highest amount of soluble fiber, said Jodee Johnson, an associate principal scientist for Quaker Oats and member of the Quaker Nutrition Sciences team that researches the nutritional benefits of oats. But nutritionists say adding savory ingredients such as veggies, fish, meat, cheese or eggs to your oats is an easy — and surprising — way to get the balance of protein, carbs, fiber and fat that you need in your first meal of the day. Let’s look at some delicious ways to add savory oats to your morning routine, depending on your breakfast personality. Making savory oats doesn’t have to be complicated. In fact, you can whip up a nutritious batch using ingredients you have in your fridge and pantry. Alycia Hammersmith, a health coach at a digital startup, says knowing that she can spice up her oats with readily available ingredients has helped her adopt and maintain healthy eating habits in the mornings. “It’s saved me from many sugar-laden breakfasts,” she says. The switch allows her to easily whip up her current favorite savory starter: oats, a fried egg and whatever greens are in the fridge. If you want to have fun with your breakfast, the possibilities are endless with savory oats. For an Asian-inspired twist, consider adding oats to the ingredients you’d normally find in a noodle- or rice-based dish. To start, swap water for a low-sodium veggie, chicken or beef broth as your oatmeal’s liquid base. Then add protein, such as eggs, cheese, tofu or lean meats, and vegetables of your choice. Try topping your meal with different condiments — think miso, white pepper or hot sauce — to up the umami. Finally, add olive oil, coconut oil or flaxseed oil to bolster the satisfying, full feeling that oats provide. Entrepreneur Erin Borges balances sweet peach oatmeal with Brie, basil and bacon. Blake Moore, a marketing strategist, uses oats as a “grain bed” for salmon, kimchi, sautéed mushrooms, zucchini, kale and seaweed, and his “breakfast curry” combines oatmeal with eggs and red or green curry paste. Chef and culinary consultant Jenny Dorsey makes Tunisian-style oatmeal with tomato, parsley, olive oil, scallions and harissa, a North African spice blend. If the thought of morning mixing still feels like a stretch, set aside time to make a large batch of your favorite recipe on the weekend, freeze it in small containers and reheat some in the mornings. Adding savory ingredients to your oats is a great way to shake up your breakfast routine with exciting new food combinations and give both your mind and your body the sustenance they need. 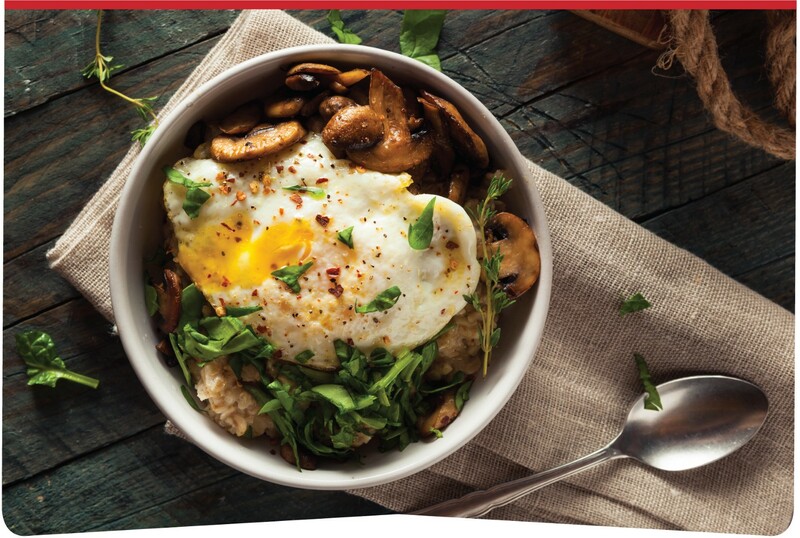 Looking for even more inspiration to spice up your mornings with savory oats? Scroll through posts tagged #savoryoats on Instagram. This article was produced by Thrive Global and sponsored by The Quaker Oats Company.